I was on my way to pick strawberries, driving down a country road when it happened. About a quarter of a mile ahead, I saw a fawn step onto the blacktop. I slowed down. The fawn saw the car, turned, and began running straight toward us. I stopped, but the truck behind me didn’t—or, anyway, not as soon as I stopped. The impact was a jolt. It didn’t trigger the air bags or injure my two passengers, but it was enough to accordion-pleat the trunk of my little Nissan Versa. The truck’s license plate was imprinted on my car’s never-to-latch-again trunk; one of the license plate screws was embedded in it. Other than that, the truck, a Ford F-350, was unblemished. When metal meets plastic, metal scores every time. The driver, age twenty, was on the phone to his mother right away. “The truck is fine,” he said. “Maybe we don’t need to tell Dad…” This was, it turns out, Dad’s truck. The young man who ran into me had been contrite; personnel from the three emergency vehicles that showed up were exemplary—it was the medic who figured out how to close my trunk with a borrowed bungee cord—and, as I said, no one had been injured, not even the fawn. My car would have to fixed, but someone else would be doing that and paying for it and also paying for a loaner car for me to drive in the meantime. At the worst, this accident was an inconvenience. I had to wonder, how many people let an inconvenience ruin their weekend? The thought of that made me grateful for the benefits of a daily meditation practice—of consciously quieting my mind, of keeping wild thoughts in check so they don’t get the chance to “ruin” a weekend. That was the day after the accident. Now, two weeks later, I’m more inclined to see the collision as a gift. After that conversation, I was feeling quite a bit of gratitude for the way this accident happened. Then this morning, I told the story to an old friend—one of several old friends who have been in car accidents that were not their fault yet left them with serious, debilitating injuries to overcome. For a few moments, I had the uncomfortable feeling of being happy about something good that had happened to me but not to a friend. But Shyamala had a message for me: “What I want you to know is that about fifteen years before my big accident happened, I was in an accident just like yours. I was driving on a country road . . .” Coming into a town, Shyamala slowed down, and the truck behind her didn’t. “And just like your accident,” she said, “there were no injuries. I thought it was nothing. It seemed like nothing—and maybe it was nothing . . .” Perhaps there was no connection at all between that one tiny collision and the accident that came years later whose physical impact was monumental for her. Who knows! It’s not as if a person can always be safe. 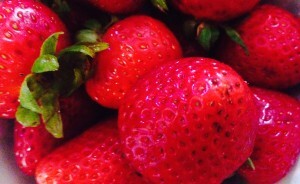 But the conversation set me to thinking: what could I have done differently on the day I set out to pick strawberries? Something occurred to me. A few miles before I saw the fawn, I noticed that a truck was following too close behind me. I looked for a convenient place to pull off and let him pass, but I didn’t see one. The next time a truck is worrying my fender, I’ll pull off at an inconvenient place. I’ll be an old woman about it. This accident could have been serious—perhaps the financial consequences are serious in that young man’s family—and I could have prevented it. Aha – that inner voice:) we so seldom listen to except in hindsight. Yes, you were lucky and it was only an inconvenience. The last time I didn’t listen to my inner voice it almost got me killed, ruined my life as I knew it and left me with fears and anxiety that I am still battling with. It resulted in major upheaval in my life – a second life, quite different from what I ever imagined for myself – in retrospect a gift? I was not physically injured, but emotionally bulldozed. Lately, I feel uneasy and adrift – wish I could learn to meditate, I just can’t seem to quiet all those trivial voices. Once, years ago, I stood next to a man who had practiced meditation as a monk in India and the energy surrounding him was simply incredible. Like stepping into the quiet of the storm, still, happy, peaceful – aligned somehow. I have a gift or curse:) of picking up on peoples vibes?, sometimes it will make me tired, depressed and exhausted all the way up to ill when I am next to some people. If I keep my distance I am fine.